I absolutely love the fetal models! They are such a tangible way to show people the sanctity of human life. When I hand them out, people are amazed that a baby at 12 weeks looks like the model. I'm always sure to say that they are medically accurate in the shape, size, and details. So many little girls that have come to our booth name their babies and take them home to make them a bed. Collectively, I have purchased over 1,000 in both white and brown/ethnic and plan to set up a table showing how many babies are aborted each work day. I am a Sonographer at a pregnancy care center and I must say these little baby models are amazing. I always show expecting parents these babies and let them know when their baby will be this size. They find them so adorable. Makes a great visual aid! We love these fetal models! They are great "attention grabbers" when we talk to the young people or have a booth set up somewhere. People are always amazed by how developed a baby is at this stage. The quality of these are great, and the informational card that goes along with them is perfect. 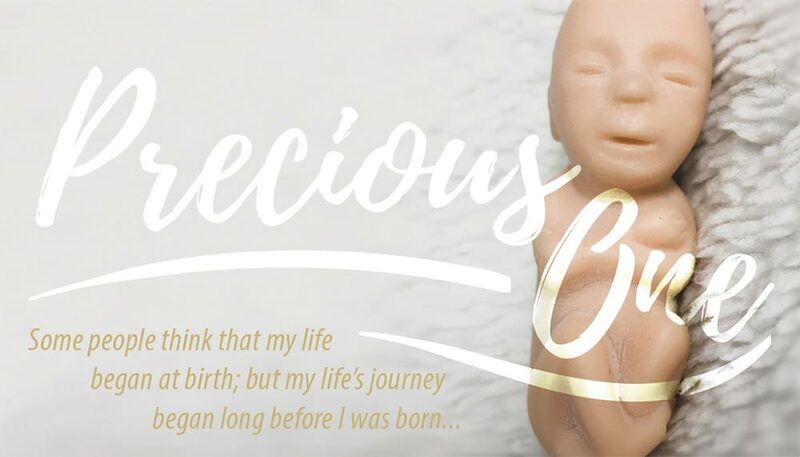 These fetal models undeniably show the humanity of unborn children. The expressions of people picking them up for the first time are priceless. This fetal model is absolutely incredible! It so useful for public outreach or even just a conversation with a friend. Also, if sidewalk counseling, it is a great tool to show a hesitant mother the humanity of her child. It is also important to memorize facts about the development of the child but this visual is very compelling. Love, love, love this product! We have used the fetal models in our pro life educational events and I have even brought them into the classroom with me. Students love them. I have found that they help to show the humanity that is already present in the womb by giving them something they can actually touch and feel. The models are accurate and are scientifically backed based on development, size, and weight. These create a great hands-on experience for those who have been misinformed. The fetal models are great educational tools. Children love to hold them and it is a great witness. This product is great for students in the classroom. A great witness for life in the womb. This product has the ability to change hearts and minds. These are by far the best fetal model to hand out. Kids love them. They are so soft and touchable! These Precious Ones are a must have for all our pro-life events. They are so soft and have beautiful details. We display the fetal model set at the fair and the families are so thankful when they are given the tiny one to keep. We also use them when we are invited to speak to different classes. Thank you for making them so life like! 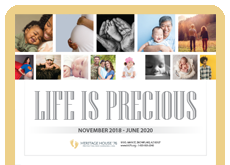 Our pro-life organization orders thousands of white and brown Precious Ones a year to give out in NYC and Yonkers, NY street festivals, conferences, outside Planned Parenthood, during educational presentations and randomly on sidewalks. We know of AT LEAST 2 babies who were saved from abortion because their mothers, who were pregnant at the time and going for an abortion, were given one of these models by one of our volunteers (only one of the women told us they were considering abortion at the time we gave them the models - the other mom just told us she was pregnant). The funny thing about it is that we did not know about the effect the models had when we were handing them out but both women told us much later that because of the models they changed their minds and had their babies: one told us 4 years after we gave her the Precious One, another 2 years later. Because of their life-like touch some people recoil when you give them the model - but most don't and gladly accept it. We even have stories of people coming back to us telling us they still had the model we gave out the previous year. One teenage girl even made clothes for the baby and another older woman says she always carries the model with her! Others have given the unborn baby models a name! We order a lot of these models in both skin tones for our county Right to Life fair booth. They are inexpensive in quantity, so we go through a lot of them. They really attract the eye of young children. I often use one when discussing how we all started out small and compare it to our large fetal model set. I prefer these soft models with movable limbs to the hard plastic ones available. These Precious One Models are very realistic and are great educational tools. Children are very interested in the models. The models make great conversation starters. The models and the accompanying card with all the details are a great tool for use in our pregnancy center. We are using them with our clients as well as with student groups. 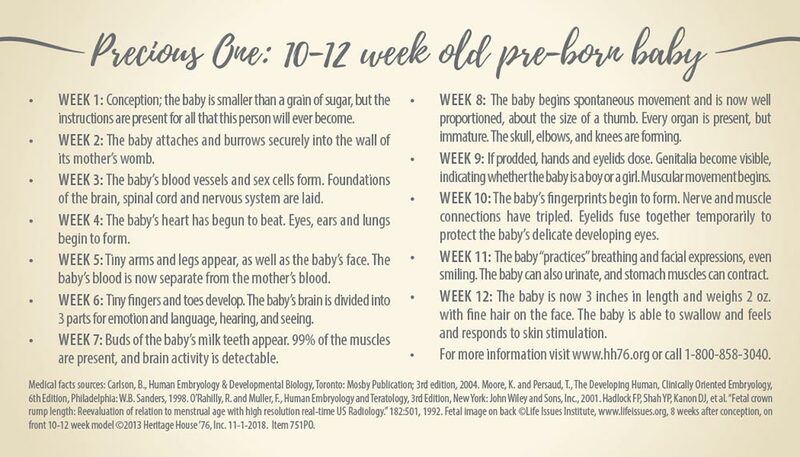 Clients and students alike are amazed at the development of babies at ten to twelve weeks. I have used them with three high school groups in the past three weeks, two of which were health education classes. Class instructors are pleased with the models, as well. One instructor told her students to be sure and hang on to the models because they would need to bring them back to class when they covered fetal development. Even with as little money as we have in our budget, I like to keep some of these models on hand. These models are excellent tools to use with our clients. They love the look and feel; and small children think they are great too. They are able to get some idea of what the new baby in their family will be like. Love the models! They are so useful when talking to people who are more visual learners! I loved the chart that came with each one that tells what happens every week! Just incredible. 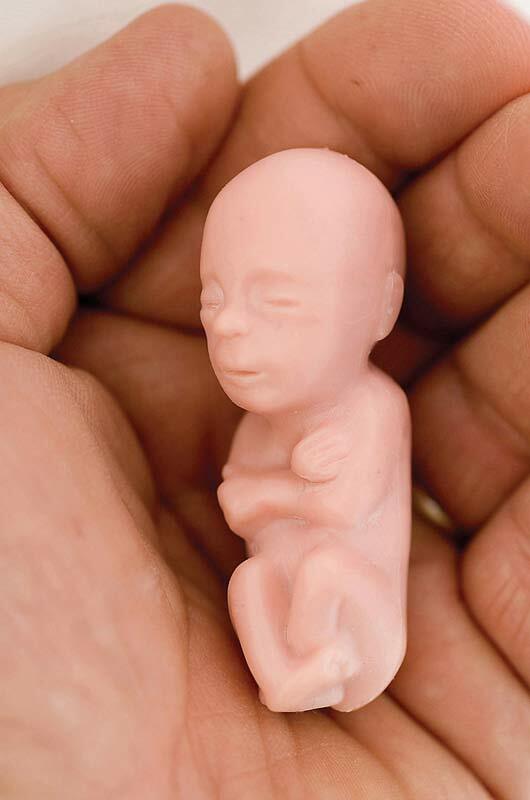 This fetal model is perfect to give to kids because they can hold it in their hands. It shows them that they were once that size, too. Parents often question what you gave their child to hold, so these are great conversation starters, as well. The name is fitting for these Precious Ones, allowing a new Mom to have a visual of what her baby may look like is indeed a precious gift. We always run out of these at the pro life booth at the county fair, even though we 'charge' a small fee to cover our costs. Fair goers love them. Not all take the information card with them, unfortunately, so we have lots of those left over to hand out even if we run out of the 'babies'. I always wonder what they 'do' with the fetal model after they leave the booth. At our Pregnancy Center, we tuck these little babies into a hand crocheted bootie along with the info card and show them to women considering abortion. They are so surprised to see how developed their baby is at just 12 weeks. It is a great tool in our center. Great tool to use with women contemplating abortion. Most don't realize how developed a baby is at 12 weeks and the soft feel when held in the hand makes such an impression. I also take these to school and youth groups when I speak. These are such a great addition to our display table and pregnancy center supplies. To have a hands on model that you can give to someone is so valuable. They will never forget holding that life size baby model. I use them for classroom and small group discussions, especially when pregnancy and abortion may come up in the topics. People always comment that they didn't know babies were so "big" at so few weeks. It truly can impact lives for good. Absolutely love these little ones. The detail and softness is just amazing. I use them to help mothers understand the size and amazing formation of their babies! They love being able to physically hold them and take them with them. Also I have given them to mothers that have suffered a loss around this gestation as a keepsake of their child and have been told they were a great help in their healing, to have a tangible baby to cuddle and hold! Thank you. These babies are wonderful to have on hand. We use them at our prolife organization when speaking to students or adults. We pass the small babies around, and when we've finished we explain that now they will always know that it's a baby, very small, but always a baby - not just a blob of tissue. I keep one in my purse and have had many opportunities to share. It's quite obvious by all of the reviews that this little 12 week old baby/fetus is absolutely a great handout to give. When you hold one, it truly gives you a sense of what a real baby/fetus looks and feels like. I don't know how anyone would be able to argue and advocate much less go through an abortion/killing of a live fetus after knowing how formed a 12 week baby/fetus really is. I was given one recently because I'm doing a presentation for my final exam at my University. These truly are made so well and life like. Definitely worth buying to give with all my other take always I'm giving to each student. I believe it's important to always give a gift like this in addition to other important facts so when someone is at home in private they can look through everything and understand it's not just a choice. It's a real living human being with a heart that beats. Thank you for making these fetuses and for having such low prices so it makes it possible for everyone to be able to purchase in an effort to save innocent babies lives. I love these little baby's. I think that they are so cool. I got mine from the pregnancy center that I take classes at and I think they are a great way to help someone realize the development of their child. We give one of these baby models and development cards to all our clients who have a positive pregnancy test to take home and share the development up to 12 weeks with their family. We believe this makes their baby more real to them and others who will help them make the pregnancy outcome decision. We use these at our County Fair Booth with our Right to Life Organization. Inexpensive way to educate not just the kids but the parents as well. The kids like these soft models but the adults tend to not for the same reason - they are too lifelike. Our Right to Life group used these babies to show visitors at our county fair what a baby 10-12 weeks old feels like to hold in your hand. What a witness to the creation of human beings in the womb. Now we are ordering them to hand out to our Kidz Fest where families play a game, putting development stages with the month it occurred. I love these tiny "squishees," as my daughter calls them. They are great for spreading awareness. I am ordering 50 more. The only thing I have to say is, they could be way cuter and less cookie cutter. I like this fetal model and so do my kids. My 9 year old wants to give them to her friends and I totally support that. Buying 50 more for the masses and my own political activism. I love these tiny babies! We passed them out at our local Right to Life booth at the fair. We had our young teen group of pro-lifers wrap them in "blankets." Each night, we were out. My favorite responses were from toddlers who want to hold them and say, "baby." 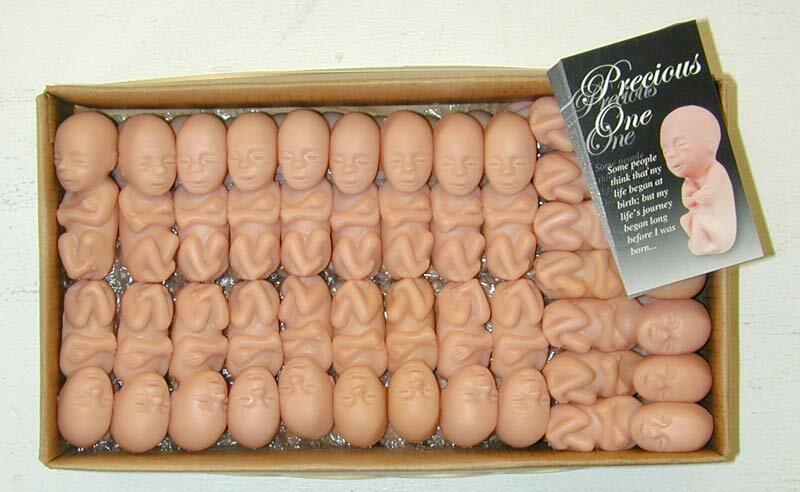 We put these fetal models in the gift bags we give to our abortion minded clients. Our hope is that the model will be another reminder that their baby is developing quickly. It is a visual that they can take with them along with ultrasound pictures. We have tons of these in our center. I show them to clients to let them see the truth of their unborn baby. I have also given one to each of my granddaughters so they understand the truth of life in the womb. This Precious One has brought many tears to our clients' eyes when they see what their baby may look like. It touches their heart in a way words cannot. Aborting moms have chosen LIFE after holding one of these little babies in their own hand. I minister in front of an abortion mill in Florida and I've seen a woman's eyes fill with tears as she stared in disbelief at this precious little model, the same size as the one in her womb. God uses these babies to save babies! My husband keeps a few of these in his desk at the public high school where he teaches. He has been able to change hearts and minds with these and Scott Klusendorf's SLED arguments. This has proved to be one of the best pro-life tools! These are the perfect pro-life tool to carry in a purse or pocket. After you've had a good discussion with a person about abortion, you can pull out the model and clarify exactly what the discussion was about. Often the pro-choice debater had no idea of the development that can't be denied after seeing one of these models. We LOVE these "squishy babies"! We have a booth at the Ventura County Fair each year and we pass these little guys out. Children and adults alike are amazed at how fully developed an unborn baby is at just a few weeks of development! They are a very eye-opening tool for respect life! We have distributed these pre-born babies at our local summer festival and have had great success and comments from fair-goers. These 10-12 week models are always FIRST CLASS! Very professional looking. I have seen and used them for 15 years through Missouri Right to Life Western Region buying them from Heritage House all that time. On my own, I have decided to start buying them, then sewing needlepoint crosses and small pockets to put in the models, information card for the model, and cross. This has brought in some donations for my group! We use these at the Pregnancy Center. Our clients love them! High Quality product at good price. Great for demonstrations to our youth groups. We just gave these out to every student at our Catholic grade school. It blew the kids away. We have a 9 month program that the kids watch (through a new poster each month) the development of their baby. At the end of 9 months, we have a baby shower and give the items to a local pregnancy center and home for unwed moms. The kids give a name for their baby. We encourage the children to be careful with the babies and not mark them. Kids love them and are not grossed out. Think of all the little dollies they have at home. It is part of the natural progression of life that they know. Awesome program! My son will be two in one month. When I was pregnant with him I was given one of these little babys. My son recently found it, and he loves it. He has named his baby Fry and carries it around all day saying when it is crying, or sleepy, and giving it hugs and kisses, or covering it with his blanket. He even pushes the baby around in his cart. It is a wonderful learning tool and I believe how it feels makes him be more careful with it, and helps him treat it like a real baby. In my opinion, these are not the best fetal models to pass out. I think the idea in making them rubbery was to have them be a little more life-like than the plastic. However, I much prefer the plastic models. In fact, I told my local pro-life group to order the plastic ones. However, my own kids (definitely very pro-life- been attending pro-life events since before birth!) have used them as erasers & invariably rip the heads off to use as bouncy-balls. This does not help to promote a good pro-life message! Also, to me, the faces look too alien-maybe that's just me. Anyway, I won't pass these out anymore for the above reasons! Sorry! One plus-if there are absolutely no other "visual aids" - at least they raise awareness in older kids/teens. Although I love these models, I have found over the years that it is not a good idea to pass them out to children. They end up being bouncy balls or stretched out of shape. To prevent children from being irreverent, I found that it is better to let them see and touch the models, but not let them keep them. These are so fabulous! More powerful than any brochure or other material we can hand out while sidewalk counseling or just educating people on the streets. They cause you to somehow respect life in a new way. They look and feel so real! Our Abstinence Education presenters use these regularly in the schools - the students are amazed at a baby's development at this stage. We give them to clients who come for pregnancy tests also. Through an interpreter I was trying to persuade a Chinese girl not to abort her child. When I gave her the Precious One she broke into tears as her baby was 12 weeks. That made the message clear for her. I recommend keeping a good stock of these for many purposes. The dads like them too. I can't keep enough of these in stock. They are so perfect and so popular and effective. We will be giving these out by the hundreds at an upcoming Abstinence event. I absolutely love these babies! I purchased these for my parish to spread awareness of the pro life message. People couldn't get over how real they seem. So many used them as a tool to explain to their kids and grand kids what babies look like in the womb. I just received a Precious One from the Culture of Life Family Services booth at the Catholic Answers Conference this weekend in San Diego. These wonderful life-like little babies are a great evangelization tool that can help start conversations and heal grieving hearts. Thank you! I love these little babies! The kids love them too! We have used them to pass out to kids during Respect Life month, but might also use them for Spiritual Adoption. I had a client's boyfriend pressuring her to abort their baby, saying "it's just a blob." After reviewing abortion procedures, I put a Precious One in his hand and with tears in his eyes he said, "I didn't know this is what it was". They chose LIFE! This fetal model can save lives! We buy hundreds of these for our pro-life fair booth and give them out on a donation basis. The young people are particularly fascinated and we always include the card that tells all about the baby's development. This is a very powerful pro-life tool! I just did my first expo with these Precious Ones. They were a great conversation starter and people loved them. The are always so amazed. These are an absolute blessing to share with our clients. When we place them in the hands of our clients so many of them will just cuddle them as if they are their real baby. They have a look of amazement on their faces and they will tell us they can't believe that it is the actual size of a twelve week baby in their womb. Some of the clients will hold the model against their abdomen trying to visualize the baby inside of them. One client, who was abortion minded, actually took the baby into the ultrasound room and as I was scanning her she laid the model on her chest and kept stroking it. After the ultrasound she made a commitment to carry her baby to term and parent him/her. These fetal models are super and a big hit at our local Community Days event - we run out every year! We find the high school age girls are especially interested in them and it gives us a wonderful opportunity to discuss fetal development and abortion with them. We have been giving these to our newly pregnant moms at our birth center for 6 years now! They are a wonderful reminder of God's design! I purchased this model and gave them as a gift to friends and families and some co-workers. Truly, this model is kind of a wake up call and a reminder that indeed it's a baby inside...not just a blob of tissue. These baby models are fantastic! A tangible 3D baby can speak louder than 2D pictures. I've been blessed to be able to give some to teachers of Science, Early Childhood Studies, and our School Counselor. Thank you for equipping us for the work of service. These models are great to have on hand! We pass them out to our clients and when we go to fairs. Our clients just love them and will sometimes ask for more to give to family members. Kids love them too and will always come up and ask for them. They are a great tool for sharing about fetal development and life inside the womb. We use these models when we are at University student activities. We are surprised at how many male students ask questions about these models. They are a wonderful educational tool. I have used these Precious Ones for quite some time at our Respect Life Ministry information table at our church. Of course, children are the ones who are most drawn to and by these reminders of the humanity of the unborn child. Thank you for making them available. I have used these Precious Ones for sidewalk counseling, very life like and effective. They are the actual weight and detail of the stage. I have also used them in teaching how special God created them to preschoolers at church. Psalm 139 That God has plans for them even before they were born. The culture for Life starts here! It's wonderful to share the truth about biological development using these Precious Ones. Great models, perfect for presentations for youth. Great visual! Our pro-life group gives these out at our fair booth and the young people as well as adults love them. A very effective way to highlight the fetal development in the womb. These babies look so real. We have kids and adults asking for these at our fair booths and other displays we set up. Our right to life chapter uses these as an outreach. I think of the 751PO as the most versatile, portable, durable, inexpensive item in my pro-life toolbox. Buy it in every ethnicity, and try to keep one of each ethnicity with you at all times. Buy extra of the skin tones that you see most often. It's cheap enough to be the item I give away to either change somebody's mind about preborn personhood, or to move them from being a benchwarmer to being an active pro-lifer in some way. I give the 751PO to clergy, pro-life medical professionals, and most recently, an artist while she was molding small clay objects. The 751PO is priced right to keep a few here and a few there...whatever bags or vehicles go with you when you leave the house. Some of my best counseling has happened on a subway. Unlike brochures and printed materials, the 751PO can't get waterlogged, and it's very durable. In some situations, I'll make a game of it and ask the person to guess how old the child is. Also, learn to say, "12 weeks" in whatever languages are spoken around you. These models are beautiful and so perfect for sharing. I founded a ministry for women of miscarriage and stillbirth - www.perfectjoyministries.com - and we use these to give validity to their grief and to allow them something tangible to hold. I have lost four little ones, and these models still bring tears to my eyes. Thank you for this wonderful work of art that is inexpensive enough to share with others. Our Respect for Life Group have given these babies to fairgoers at our table at our town's summer festival for several years. We have had positive responses, surprisingly many from teenage boys. These are absolutly awesome. Opens eyes to reality. The softness is so life like and palpatable. I use this in the counseling room and in abortion recovery Bible classes. Greatest tool when facing and teaching fetal development and the greatest part only $1.50!!!! Great job Heritage! I love handing one of these Precious Ones to a client when I give them their test results. They are so realistic in feel and size. They can see what their baby looks like or will look like shortly. They keep it with them as a reminder. What a wonderful tool for sidewalk counseling, presentations, and Pro Life booths! These little babies show people that fetal babies are, in fact, babies and not just a mass of cells or tissue. I also carry a couple in my purse to show people if the subject of abortion comes up. These precious baby models are the perfect gift for our clients as they are absorbing the idea of a positive test. I have not heard one negative response in the 2 years I have been offering these to our clients. Their eyes light up at the idea that the baby they are carrying is almost the size of these models. Definitely a "must" in any pregnancy center! These are great! We bring these to high school health fairs and they students are amazed! We give these to our clients when they reach 10-12 weeks in their pregnancy. Many times they have not yet had an ultrasound. They are always amazed at the detail and realizing how developed their own baby is. These models are very popular in our clinic. We give these out to our expectant moms following their ultrasound and they are touched to take them home to show to their family members. Also very popular when we do school presentations. 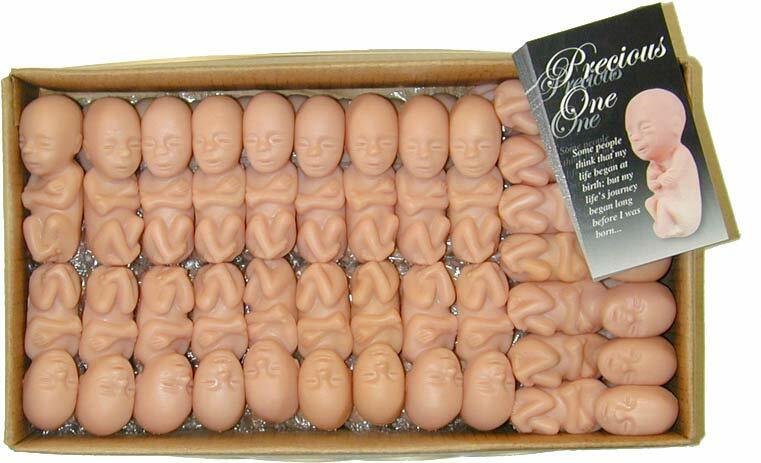 No other item that we hand out has the amazing effect that these fetal models have -- instant attachment to the unborn! So many times, we hear, "Awwwww! That's adorable!" Or we just see a girl's tears begin to form and fall. Even the young men are touched by this evidence of real life (not just a blob of tissue) in the womb. These precious fetal baby models are wonderful. They help attract both adults and children alike over to our Right to Life booth on pro-life Sundays. The children especially like to hold them. The babies help us to open up a dialogue on how precious the baby's life is. These are EXCELLENT! We give these out at health fairs at nearby colleges and the response is amazing! College kids stop by the table just to see why we have a basket full of little babies on the table, and it gives us an opportunity to speak to them! Great tool! We use these babies with our expectant mothers. It is amazing to watch them as they hold these tiny replicas of life and see its development. We love to watch their faces and hear their comments. These are made out of a very soft rubber, and fit gently in the palm of one's hand. This tactile presence is quite emotionally powerful, in a way that photos can't communicate. I gave one to my kid sister, and just explained to her it was a very small baby doll. We swaddled the doll in a small blanket and made a little cardboard cradle for it. I think this is something non-controversial we can do as outreach with small girls. We don't have to even discuss abortion, just tell them 'this is a baby doll exactly how a baby is in its mommy's tummy, 6 months before it is born.' They will remember this doll. It could be a classroom craft project (making little cradles out of cardboard). It is a very quiet, powerful way to let little girls (6 or 7 year olds) celebrate the personhood of little babies. I bought 500, so I can pass out to the 7th and 8th grade religious ed classes each year, and to anyone who is interested. These children are always so amazed how perfectly we are made, at 10 weeks. These are used in the pregnancy center where I volunteer. They are given to churches and used as part of a display about supporting pro-life causes. People see the babies and are amazed. Great way to help young pregnant moms relize that they are really carrying a baby. After using the harder plastic 'Young One' in my abstinence classes in the public schools, I am really thankful for this newer "Precious One" which feels so life-like in comparison. The students often 'tossed' the harder plastic models as they passed it to the person next to them---but these Precious Ones feel so different, I have yet to have a student to not 'respect' them like they were real. Thanks for this newer model. A big success!!! People just love them and the volunteers have taken them to have a tangable way of showing people from conferences or friends about the value of life. Our Legion of Mary group passed these out in front of church. My friend knitted little blankets for them and we distributed them to children and adults with an explanation of fetal development. They were a hit!!! We have been using these in Respect Life Ministry. Have given them out when discussing life issues in RCIA and Confirmation classes. Also use them when counseling mothers in crisis pregnancy situations. This is a repeat order. We use them with SS. Peter and Paul Spiritual Adoption Program. The coordinator ties the card around the baby with pink or blue ribbon and places them in a flannel lined basket. It is heartwarming to watch children leaving church and stopping to look at the beautiful babies. If their parents allow it the children love taking a baby home with them. This is a most powerful tool! These fetal models are our most effective evangelism for life tools. During our family outreach at the Beaverhead County Fair, alone, we gave 78 models to children who learned to share that "A person is a person, no matter how small!" Great example that we use in our EWYL program! As a Director at a Pregnancy Center we gave out many of this babies along with the cards. These new soft rubber ones are so much better. The cards that go alone with them is very well written and informative. We have handed these out at the county fair to little kids. Two weeks ago our guest speaker for our annual benefit dinner ended his talk by bringing this precious little one out of his coat pocket, described the gestational age of the child, then out of the other pocket he pulled out a clear glass tube used in first trimester abortions. That powerful visual was enough to bring tears to every eye - men and women alike. He encouraged us to always carry around this Precious One and a "slurpie" straw available at the local 7/11 (it's the same diameter as an abortionists tool). Thanks for making these available at an affordable price. These have been an invaluable tool in explaining fetal development. While looking at this perfectly formed baby you can easily debunk all falsehood about this being a "blob of tissue". We have used them at the fair with great success and now with the up and running ultrasound mobil unit in Tulsa. We just got some of these soft babies. They are wonderful. We have used the hard plastic in the past, but these are so much more lifelike in features, touch, and weight. Makes a huge impact on the abortion bound mother. Definitely think they're worth paying the extra over the hard plastic. We give these 10 to 12 week old models to children, young men and women, and adults. Most of them marvel at the developement of a 10 week old baby in the womb. We also give them out at church, reminding people of what life looks like and feels like at 10 weeks. We also remind them that if they vote against life, against God, they are voting to kill these small unborn babies. I make sure to have these on hand when sidewalk counseling to show a mom what her child looks like at 10-12 weeks. They are also great to hand out at fairs and festivals. All the kids want one. The deal is, they can have one when they tell me what is is. A common answer is "It's a fetus", so I ask them what fetus means. Once they learn that the pre-born is truly a human being, then they get one. It's a short conversation, but is very fruitful! I've carried these in my purse for well over 10 yrs. I put each one w/the info card in a plastic bag and show them to various people. One young lady looked at it carefully and said, "I didn't know it was a real baby at such an early stage of the pregnancy. I'll never do that!" Gave me goose bumps. I've also left them in my locker at the gym and on tables in restaurants w/ a post it. Not a Toy. Some times when someone is talking about a relative who is "in trouble", I offer one to them. Some times they take them w/a big thanks. Each year we hand these out at our booth at the business expos. The children are especially drawn to them. We even had a local doctor pick one up and when a staff person went for a checkup the following week she saw this fetal model on display in the physicians exam room! There is nothing like showing an expectant mother what her baby looks like. Some times it is hard to grasp until you have something visual to show them. Fabulous tool. When you put these in people's hands they are overwhelmed by the feel and size. There is just something about these little guys. They are worth the extra money over the plastic ones. These are wonderful! We have used them in the past and bring them to schools to talk about fetal development. The children are always amazed and we love them! I ordered the precious one models for an eighth grade class. They were very lifelike and great for the kids to see. I told them to keep them in a handy place because seeing is believing. Yup, these are the real deal! Love them. They also work well to have on hand when going door to door. Those who believe it is a choice need to see what they are chosing to destroy. We order these wonderful babies every year to give to area students during 40 days. "The precious one" is a very powerful visual aid when counseling women at our pregnancy center, it can have a great impact on their choices. These fetal models are so realistic! We have handed them out to the teenagers and young children at our church & have had a great, surprised reaction. It has opened up a lot of discussions. These tiny little models make a big impact in the lives of our clients and touch the heart. They are an eye opener not just for the client but for her immediate and extended family. I have one of the fetal models (12 weeks old) I used it with my Sunday School class. Everyone was amazed at what size a baby is. Everyone had to touch and examine it personally. I have had only one child but I did not realize that a baby that young looked like a person already. This is an excellent visual aid. These 'little ones' are an amazing tool for sharing the truth of life and also for sharing the great love of God to those who don't know or understand His love. I carry them in my purse to give away. Also, have different organizations (cheerleaders, youth groups, etc)bag them in small baggies. Lots of help and educational for them. These models have been very useful when witnessing to stranger about fetal development. I keep a this model in my purse. Even more valuable is how they help my children understand the development of a yet-to-be-born sibling. When I was pregnant with my last 2 children, my older kids would bring this little baby model to school for "show and tell". They would announce that Mommy is having a baby & their brother or sister is 11-12 wks old in Mommy's tummy. They would then pass around the model to show the other children what their youngest sibling looks like. Makes a HUGE impression on them! VERY effective sidewalk counseling tool! Literature is great but this visual is effective by itself or with other brochures! A "must have"! My sidewalk counseling partners and I have been handing these out at the local abortion center, at high schools, churches, and at community events for the past year. We have given away about 6000, and they are very well received! As soon as my order arrives on my doorstep [THANKS for the speedy delivery], I start wrapping each baby in a flannel "blanket" tied with ribbon. These fetal models are fantastic teaching tools, wonderful for community outreach. AND we get lots of "saves" at the abortion center thanks to the Precious One! This fetal model has been a blessing. It is very realistic, and the face has wonderful detail - including the indentation of the top lip. The softness of the model really resembles the feel of a newborn. My friend (who was until recently pro-choice) saw my model and said "It looks just like a baby!" Thank-you Heritage House for helping spread the truth of life. We used the models at our local fair last year. Handed out 140 White, Black, and Brown. They were gone before the week ended!! It brought conversations about the baby, and were able to council. Pregnant moms, teenagers, and young children all loved holding them. We have a fetal set, and the fair goers love to hold the models, and now they can take one home, and for some in their native language. Thank You for offering them. These are an amazing tool to use with clients who have not made the connection between their pregnancy and the fact they are actually having a baby. We use these with every abortion minded client and we have had great success. I wish you had a higher rating than 5 stars. We used these at our state fair booth in August. We handed out 2600 babies within the first few days. There were people standing in line at our booth waiting patiently to get their baby and listen to us explain the 12 week baby in the womb and what the baby was. They asked questions and took other literature. The expressions on some faces when they held their baby in their hand was such a blessing. Children would gaze in awe when we explained that their parent was once that size. People came back asking how to get them for their church groups, youth groups, and classrooms. We are praying to be able to hand out twice as many next year. 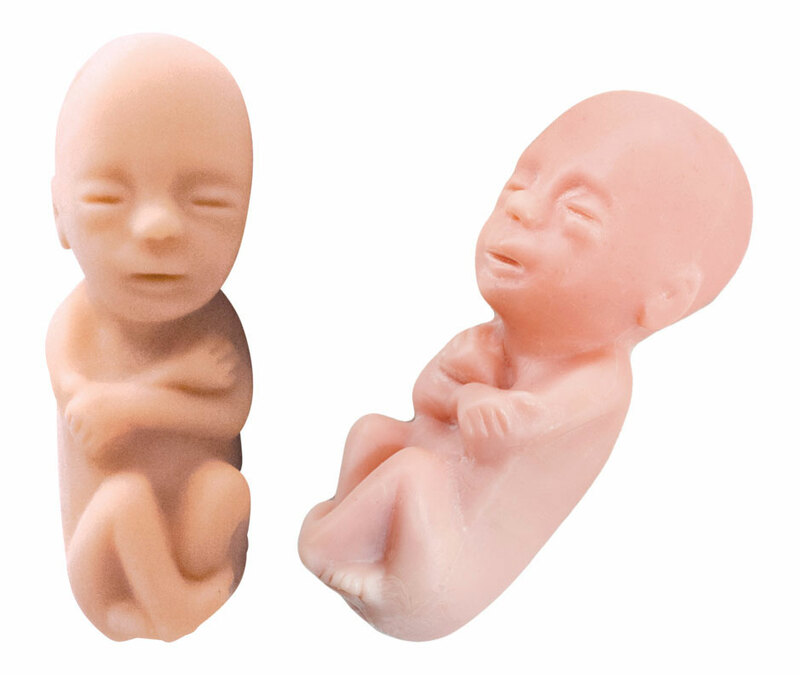 We have ordered these fetal models many times and are very pleased with their quality. The children especially are amazed when you tell them that they were once this small.